Easy to make, a great little snack. Tuna filled egg pintxos are a classic made with simple ingredients for a tasty and satisfying snack. Is a great complement to a mixed green salad. Serve with your favorite wine or a cold beer. Great tasting, easy to make egg fish salad. Tasty enough to be served as an appetizer or complemented with a salad. You can also use tuna, but be aware that the taste of tuna is rather overwhelming – therefore any kind of white fish will do. Serve with a cool glass of dry white wine. A surprising combination, but the bacon works great with the shrimp. Great on its own or accompanied with salad. You can also use it as a dip with some bread sticks or nacho chips. Enjoy with a nice red wine or a cold beer! Roasted pork belly – my favorite! Can also be prepared as a full-fledged sandwich, just don’t slice it into portions. Makes a great, full-fledged lunch! A surprising take on the classic omelette. A real eye-catcher that surely will be the talk of the party! Great for kids, they love the little tortillas! Also tastes good without the shrimps. 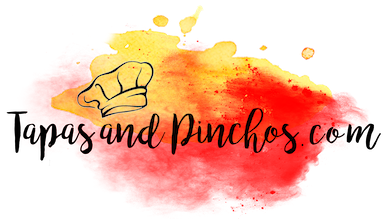 Receive delicious tapas and pinchos recipes directly to your inbox! Join our mailing list to receive delicious recipes. We don't like spam and we'll not share your email with anyone!